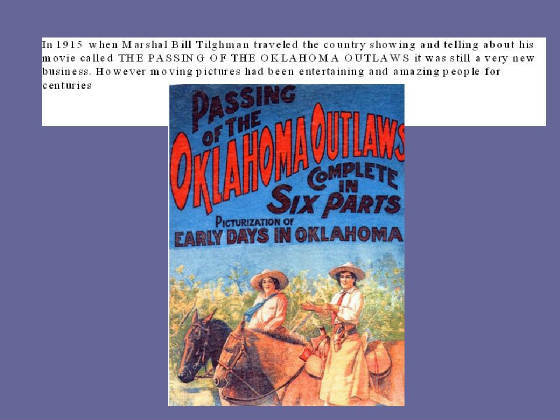 Bennie Kent was a pioneer of newsreel film and worked with Bill Tilghman creating THE PASSING OF THE OKLAHOMA OUTLAW. He documented life in Oklahoma from the turn of the century through 2 wars and many celebrations. Join us in honoring his life-long love of preserving our history on film. While Missouri thrills over the making of a semi-historical moving picture on “The Life of Jesse James” an Oklahoman is going quietly ahead with another movie, one which he has spent 35 years in making. He is J.B. “Bennie” Kent, one-time ace newsreel cameraman for Pathe News in Oklahoma. 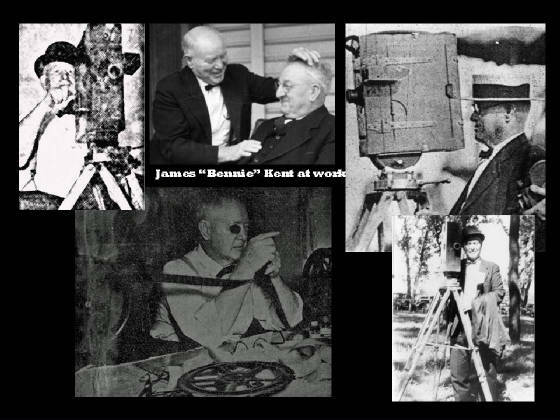 Kent’s picture is made up of actual newsreel film, taken in Oklahoma from its earliest days to the present. 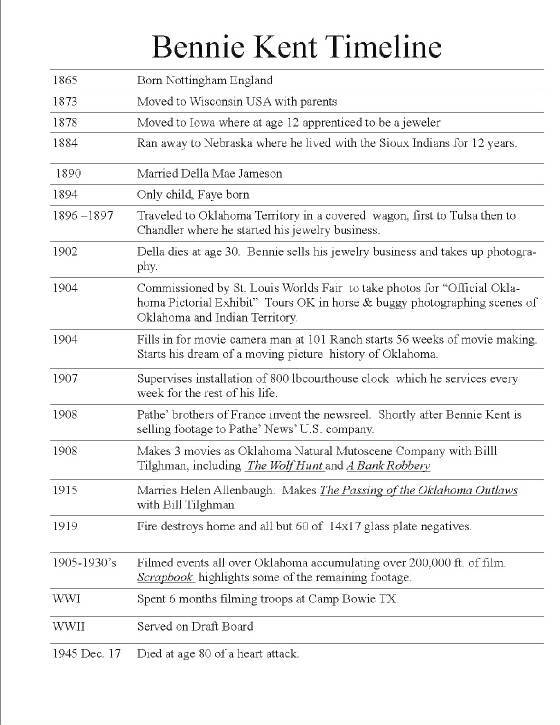 (1937) Kent has covered every Oklahoma gubernatorial inauguration. He has filmed drouths, floods, civil warfare, beauty contests, oil booms and religious services-from Indian stomp dances to the visit of a Roman Catholic cardinal. Kent’s life story might well make a movie plot. Born in England 71 years ago (1866) , he came to the United States with his parents and settled in Wisconsin. 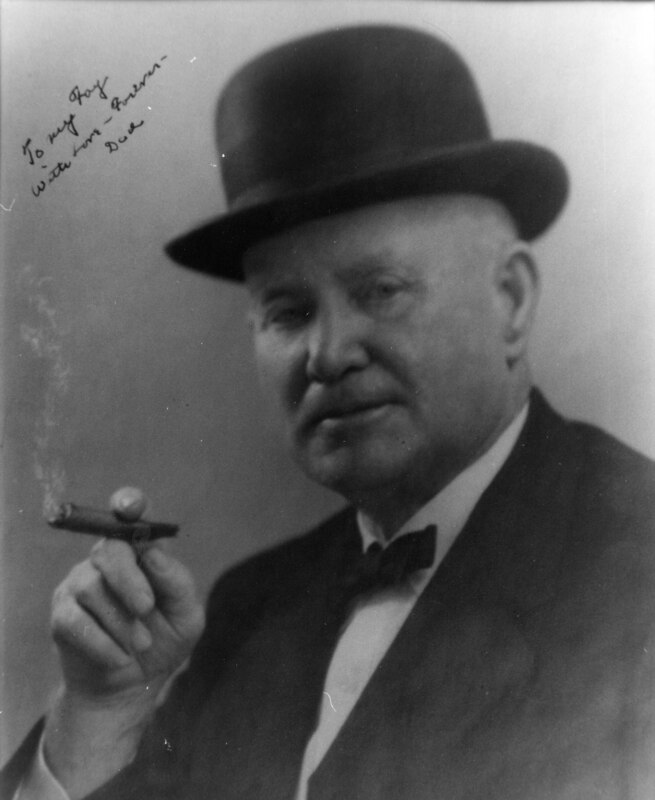 Later the family moved to Iowa, and at the age of 12 Bennie was apprenticed to a jeweler. Six years later he ran away from home, drifting into Nebraska. He settled down with the Sioux Indian tribe, learned their habits, then struck out for Oklahoma in a covered wagon. He turned to photography, first as a hobby, then as a profession when the St. Louis world fair committee commissioned him to photograph Oklahoma. With an 11 by 14 “still” view camera, he toured the state with horse and buggy, photographing phases of Oklahoma life. Pathe News needed a representative in Oklahoma, so Kent became a cinematographer. His first movie camera he had made to order in Chicago. When it was worn out, he bought a Moy camera made in England. That was 25 years ago, and the old Moy today is a far cry from the modern sound cameras. But under Kent’s expert handling, it still works, and though it is seen less often around Oklahoma than it was in the old days, Kent , with his black bowler hat and long cigar still is on the job when news is breaking. But today, he is less active. His bright blue eyes retain their sparkle, but he is more content now to stay at his little farm two miles from Chandler, helping his wife, who was a portrait photographer before their marriage. Much of life has passed before Kent’s eyes, and it has left him cheerfully philosophical. His chief f ambition now is to piece together the 100,000 feet of movie film he has in sealed boxes at his home into a chronological history of Oklahoma. Half of each day he spends editing the film, cutting, splicing– building a history. Only Kent can understand the scenes now on the film, but someday he will have his picture completed. And it will be an authentic, animated history of the state, probably the only such picture in the world. And so, to quote him, “through smiles and tears, let us watch the years of our lives go by again. 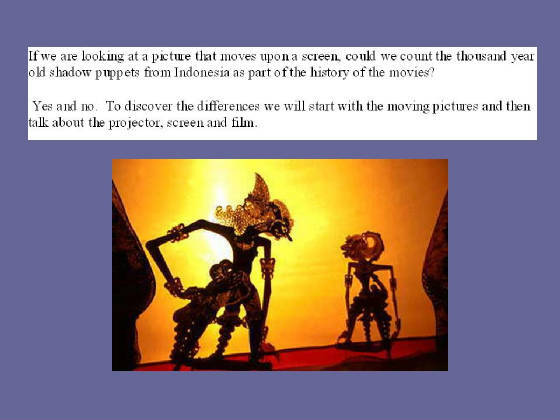 Below are the first 3 of 40 slides of a power point, many of which have multiple images plus text or instructions. 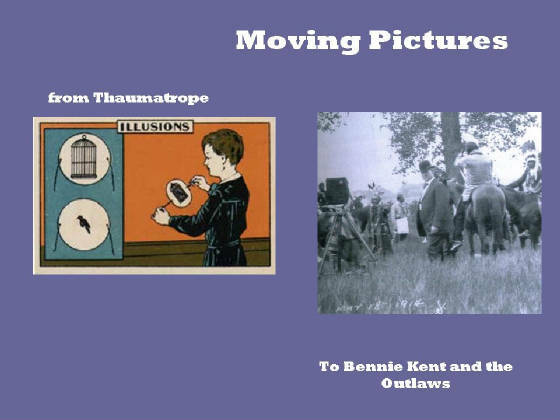 If you make a reservation to bring your class to the museum on Thursday or Friday Nov. 1 or 2 for film viewing or if one or more of your students submit a film, we will send you a free cd of the power point presentation MOVING PICTURES FROM THAUMATROPE TO BENNIE KENT AND THE OUTLAWS. The cd includes instructions for making early animation toys.